When you want to relax with a glass of wine, after a long day or just to have a nice evening, there could be nothing better than a perfectly chilled glass of your best wine. Yes, you can put that bottle of wine in your refrigerator and pull it out when you need a glass. What if you have company and want different wines? Having a separate wine cooler is a necessity if you are a person who enjoys a glass of wine every now and then, of not regularly. When you have company, it is always impressive to offer them a choice of your best collection, all chilled to perfection. A good cooler with sufficient number of racks is what you need. The Haier 18 bottle wine cooler is the perfect wine enthusiast wine cooler as it can chill all those bottles to the temperature of your choice. Want certain wines more chilled? This dual zone cooler can fulfill that need too. If you check online, you can come across some great Haier wine cooler reviews, which are sure to convince you to buy it. However, you need to know the product in detail, before buying it. Free Standing – This cooler from Haier is a free standing appliance that needn’t be used with any refrigerator or other appliances. It can be placed on the floor in your room, near the refrigerator or even on your kitchen counter. Compact – Want to have your night cap on the patio? You can move this cooler and connect it anywhere too. It is compact and measures only 9.9 x 20.3 x 37.2 inches (WxDxH). Thermoelectric Cooling System – In this type of a cooling system, there is no compressor in play. Hence it is noise free and vibration free too. This technology is very reliable and maintains the temperature effectively. Bubble Free Wine – When there is no vibration in the cooler, the bottles don’t rattle. This helps in preventing those unwanted bubbles from forming in your stored wine. Low Maintenance – With no compressor present, the maintenance required is very little. There are no coolants such as CFC, HCFC, or HCF used. Hence there is no refilling required either. The shelves can be pulled out and put back easily, a basic requirement to keep them clean at all times. LED Controls – The controls are simple and easy to understand. The touch screen enables you to set the temperatures with few feather touches. No more twisting or turning of knobs or pressing buttons. The LED digital display shows you the temperature settings. There are 2 separate displays to show you the temperatures of both the top shelf and bottom shelf, independently. Dual Controls – Want few bottles chilled more than the others? This dual cooler has two different temperature controls, for the top and the bottom zones. The top zone racks can be chilled between 54 degrees to 66 degrees. The bottom zone has a lower temperature range of 46 degrees to 66 degrees. Interior Lighting – The interior of the cooler is well light with a soft blue light. This blue light not only allows you to organize the bottles easily, but is light on your eyes too, if you are using the cooler in a low lit area. It also adds to the sophisticated and professional look. Attractive Design – This wine enthusiast wine cooler is very well designed with a steel finish and glass doors. The doors are separate for the upper zone and lower zone, thereby ensuring the temperatures are not affected due to constant opening. On the inside, the shelves are chrome tinted and are lit with a soft blue light. This design is pure sophistication. Double Glass Doors – The door of the cooler is made of double glazed glass doors. Apart from enhancing the appearance, these doors also help in maintaining the temperature. The cool air is retained on the inside and the heat from the outside is not allowed to penetrate. This in turn reduces your power consumption as the machine need not work too much to maintain the set temperature. Despite having so many great features, this appliance has a few flaws too. Not Long Lasting – This unit has quite a number of features that make it stand apart from the other products in the market. However, these features do not last long. The temperature control, the noise free cooling system and the thermometer, which enable you to know the temperature, are the technical aspects which don’t last long. Doesn’t Store Settings – There is no facility to store your settings. One cannot always be at home to keep changing the settings to the preferred temperature, in case of a power failure. When the power goes off and comes on, the cooler goes back to the default setting. If this were to happen when you are way from home, your wine can be ruined. Also, this makes this unit unfit to be used in your cabin or guest house that you would visit only occasionally. No Light For The Lower Zone – This dual zone cooler has a metal partition between the upper and lower zone. However, the light is placed at the top and hence doesn’t reach the lower zone. Though you can open both the doors separately, the lower zone will need external lighting or you must open the upper door, to get some light on the bottles at the bottom. Low Power – The electricity used by this Haier 18 bottle wine cooler is low when compared to other such coolers in the market. On an average, using this cooler will barely make a significant difference to your monthly electricity bill. Now, that’s good utility at low cost! Compact – This wine cooler is sleek and compact despite having a capacity to store 18 bottles. It is neither bulky nor occupies too much space. Quiet – Since this cooler uses thermoelectric cooling system, you will be rewarded with silence when you use this cooler. No vibrating, jarring or motor humming noise when you wine gets cooled by this cooler. For Both Wines – If you are a wine collector, you would be aware that white wines and red wines are different not only in taste but in other ways too. They need to be stored at different temperatures to get the best out of them. This dual zone cooler offers you the perfect solution to store your collection of both red and white wines. Auto-Defrost– The automatic defrost system in this cooler ensures the glass doors are free of frost at all times. A little frost can ruin the look of your cooler and hinder your view when you want to check your collection. Wine collection is not something everyone does. When you are into it and love your wine, you must have the perfect product to store it at the right temperature. 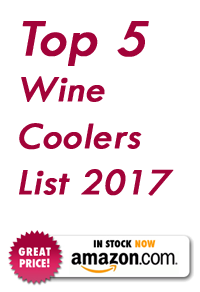 The Haier wine cooler reviews have more advantages listed for this wine enthusiast wine cooler. 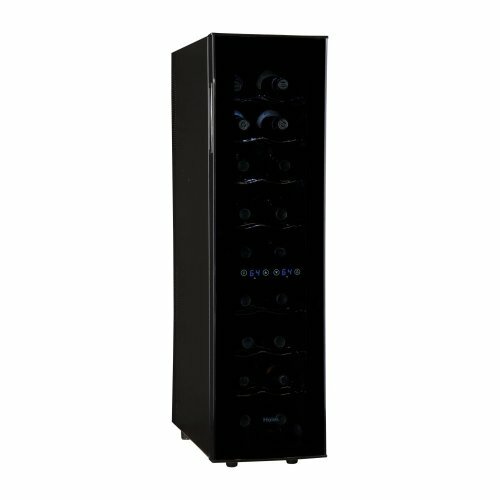 If you own the Haier wine cooler 12 bottle cellar, the Haier 18 bottle wine cooler is an upgrade you must have as your collection increases. It is light on your pocket and gives you a great way to store those bottles.